The phrase “we’ll fix it in post” describes an awkward approach to video production. While a bad production can sometimes be salvaged by masterful editors, there is no substitute for a well-coordinated production. At OctaLouie, we understand the full process, and try to get involved as soon as possible to ensure a high quality production that begins with well-conceived pre-production, culminating in a final presentation that everyone involved can be proud of. Our editors understand the importance of production management, conceptual consistency, graphic flow, the balance of proper timing, and intuitive vision. The Octalouie team uses Final Cut Pro, Soundtrack Pro, Motion, Photoshop, and DVD Studio Pro in their arsenal of post-production tools. Editing can either take place at the Octalouie/Chrissy Field Production office at the Presidio in San Francisco, or on-site thanks to the portable Mac workstations, which allow us to travel anywhere in the world where there’s electricity and delicious cuisine. 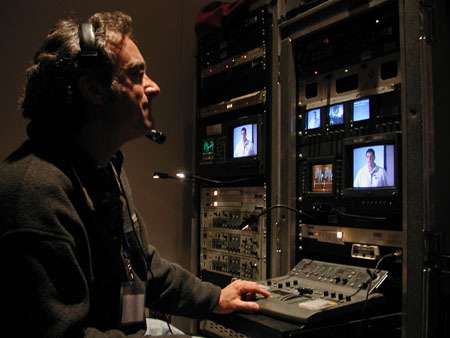 The Octalouie team has the ability to transfer various formats including HDPro, HDV, DVcam, DVpro, MiniDV, Digi8, Hi8 mm, Betacam SP, 3/4″ SP U-Matic, SVHS and VHS.